The cost of a healthy food basket is estimated to be around $1000 per month for a family of 4. Depending on your family’s income, $1000 may seem like a lot! It may vary depending on where you live, but I’ll use this report as a reference because it makes it easy to understand. In the report, it looks like they used the regular price of the healthy foods to make this estimate. By using some savvy shopping tips, you can probably spend less on groceries than their estimate. This estimate is also assuming the family is eating a nutritious diet and does not include any takeout or restaurant meals. If health is not a focus of yours, and you just eat the cheapest foods you can find, that is ok too. I’m certainly not going to judge you by doing what you need to do to get by in whatever way you can. Spend less on your groceries with my top tips! 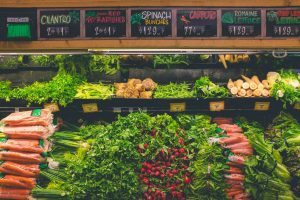 I’ve made a comprehensive list of the best tips to spend less money on groceries. If you implement all, or even just a few of them, you are bound to spend less on groceries over time. This posts may contain affiliate links, which means I may earn a commission if you purchase something through my link at no extra cost to you. Please note that this is a list of ideas only. I recognize that every option may not be available to you, depending on factors such as where you live, if you have a car, if you’re physically able to go to multiple stores, if you have a smartphone, if you work multiple jobs just to get by and don’t have the time. These are just suggestions and in no way do I assume that they’re available to everyone. The important thing is to get curious, explore what options are available to you and keep trying new things to keep your grocery bill down. Compare prices at different stores. Consider making several stops to get the best prices on your staples, or just choose the store with the best prices overall. Take advantage of coupons. Even a few dollars here and there is worth it. Buy discounted grocery gift cards. You might be able to find them on gift card resell sites for 1%-3.5% off or more. I get gift cards on the trading site Bunz. You can list your unwanted items and trade for other people’s unwanted items, which sometimes include gift cards! Get $1 just for signing up through my link! Plan your meals for the week. This can help you avoid grabbing takeout because you have nothing planned, and it can help make sure you buy what you need to make complete meals, instead of forgetting key ingredients and having to waste time going back to the store. Plan your meals to coordinate in order to use similar ingredients so none goes to waste. Look at flyers to compare prices. If your store offers competitor price matching, bring the competitor’s flyer and get the lowest price matched! Plan your meals around what you have versus buying new ingredients all the time. Substitute expensive ingredients for more affordable ones. A good example is using powdered milk instead of fresh milk in recipes. You won’t even notice the difference in flavor, but you’ll save money! Learn recipe substitution so you can adapt recipes to what you have, or substitute less expensive ingredients. Plan to make less expensive recipes. Make a shopping list and stick to it! The shopping list should include the ingredients you need for your meal plan. Shop less often. The more often you go to the store, the more likely you are to buy things you don’t need. Cook at home instead of eating out. You can easily feed yourself a healthy diet for a whole day for less than the price of an average restaurant meal. Even the least expensive fast food is pricier than most homemade meals. Pack your lunches. Again, a packed lunch is way less expensive than buying lunch every day and can go a long way to helping you spend less on groceries. Always have water and a snack on hand to avoid impulse purchases when hanger strikes. Don’t shop on an empty stomach. Shopping while hungry may influence you to make impulsive decisions. Budget your groceries and eating out together instead of being in separate categories. It’s easy to cut back on your grocery bill by eating out more if you look at them as separate categories! This will help you see the true cost of feeding yourself. Bring your own bags to avoid paying for plastic bags. Use a rewards credit card to earn rewards or cash back for things you were going to buy anyway. Make sure to pay off your monthly bill in full. Use cash if you don’t trust yourself with credit cards. Use store loyalty rewards cards to earn free groceries! Cash back, coupon and price comparison apps make it easy to spend less on groceries without much extra effort at all! I like Checkout51. Try it for free now! Caddle is also great for Canadians! You’ll get $1 just for signing up and using the promocode 56532. Combine coupons with sales, marked down items, store loyalty points, rewards credit card AND cash back apps whenever possible for best savings! Shop sales and loss leaders to get the best deals on your regular items. Stock up when items are on sale. Try not to pay full price! Hack the grocery store. When paying price per item, choose the biggest one. When paying by weight, buy only how much you need. Also, make sure to take off extra leaves when paying by weight! Watch the screen to make sure prices ring in correctly. Make sure all discounts are applied at the till. Before you leave the store, double-check your receipt to make sure it’s correct. Price match between different stores and consider making a couple stops to get the best prices on your staple items. You could also price match at the store and choose the brand with the best prices. Only buy as much as you’ll use. If you get too much to use up in time, it’ll just go to waste! Know your prices and try to only buy when it’s a good deal. Buy seasonal produce. It’s usually fresher, tastier, and less expensive. Win-win-win! Shop clearance racks and marked down items. Get the items you’d normally get and you’ll definitely spend less on your groceries! Avoid buying something just because it’s cheap! Shop before holidays when the store will be closed to get markdowns on perishables like bread. Shop for seasonal clearance items after the holidays. The stores try to clear out the seasonal items and packaging by putting them on clearance. I don’t know about you, but I love getting crackers with a Christmas-themed box for 50% off! Shop close to the time when the store closes to get marked down perishable foods they want to sell. Shop the international isles for better prices on spices and other foods. Look at the top and bottom of the shelves to find lower priced items such as generic and lesser known brands. The expensive brand names pay more to get the shelves at eye-level. Compare the price of frozen versus fresh fruit and veggies. They’re often less expensive and are already prewashed and chopped. Bonus! Don’t be brand loyal. 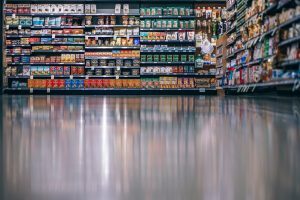 Consider store brands and lesser known brands which tend to be less expensive than the big brands but are often just as good! Compare unit prices at the store. The price per gram (or kilogram, or pound) is the easiest way to see which product has the best price. Some stores even list the unit price on the price tag! Don’t buy individually packaged foods. They almost always cost more per gram than regular packages. Don’t buy prepared foods. You’re paying someone else to prepare and cook for you and it’s often not worth the price. Don’t buy non-grocery items like toothpaste and toilet paper at the grocery store. They’re usually more expensive there. Buy in bulk when it makes sense. Often, it’s less expensive, but make sure to compare prices. Skip organic foods so that you have enough money to spend on nutritious foods. It’s better to get enough conventionally grown produce than less organic. Skip unnecessary supplements and spend that money on nutritious foods instead. Return your cart to get the coin back. If your store makes you put in $0.25 or $1 into the cart to unlock it, take the extra few moments to go back and return the cart to get your money back. Eliminate food waste! The average US household spends $1500/year on wasted food! OMG! First in, first out. Rotate your food to make sure you use up the older food before the new stuff so it doesn’t go to waste. Store your food properly to keep it fresh longer. Use up your leftovers instead of throwing them away. Freeze foods you won’t use in time. For example, overripe fruit can be frozen and used in smoothies. Learn how to tell when food is still good to eat and when it has gone bad. Wilted veggies and dry bread aren’t ideal, but can still be used in many recipes! Use all parts of the food. Save vegetable peelings and bones to make homemade stock. Grow, gather, or hunt your own food. Brew your own alcohol instead of buying from the liquor store. Practice mindful eating by serving yourself based on your hunger cues, not on the size of your plate or “suggested serving size”. Make your own ready meals & freeze them. Soups, chili, curry, casseroles, burritos, & lasagna all freeze really well and make for a quick meal to reheat when you’re pressed for time. Making your own saves money versus buying pre-made meals, and will help you avoid grabbing takeout. Keep a well-stocked pantry. This allows you to cook a variety of meals at home. It will also help in case you run out of money before the next paycheck. You’ll still be able to feed your family. Try a monthly no-spend week. Pre-plan a week each month where you try to use up what you have in the house. It also works well to have a day where you use up all the leftovers. Reduce single-use items like plastic baggies, paper towels, paper napkins and plastic wrap. A typical household could easily spend $1/day or more on disposables! Why not spend that money on good food and use reusable containers and napkins instead? Consume fewer bottled drinks like water, soda, juice and alcohol. Bottled drinks aren’t necessary in a healthy diet and can really add up on the grocery bill. Return bottles and cans for deposit. If you live in an area that gives money back for recycling bottles, make the effort to get your deposit back. Eat less junk food like chips, cookies and candy. They’re expensive and not necessary in a healthy diet. Consider eating less animal products like meat and dairy, which are some of the most expensive grocery items. Try new recipes using plant-based sources of protein like beans, lentils or tofu which are quite affordable. I bet even if you’re the most frugal grocery shopper you found a new tip to spend less on groceries! 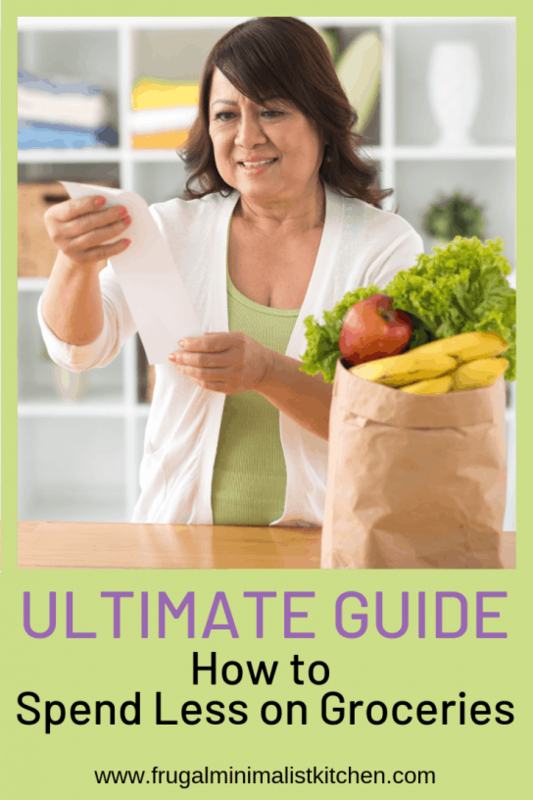 Whether you’re frugal by choice or by necessity, I hope you found this guide useful. Tell me which tip are you going to implement? Did I miss anything?